The Royal Military Academy Sandhurst (RMAS or RMA Sandhurst), commonly known simply as Sandhurst, is one of several military academies of the United Kingdom and is the British Army's initial officer training centre. It is located in the town of Sandhurst, Berkshire, though its ceremonial entrance is in Camberley, southwest of London. The Academy's stated aim is to be "the national centre of excellence for leadership". All British Army officers, including late-entry officers who were previously Warrant Officers, as well as other men and women from overseas, are trained at The Academy. Sandhurst is the British Army equivalent of the Britannia Royal Naval College Dartmouth, Royal Air Force College Cranwell, and the Commando Training Centre Royal Marines. 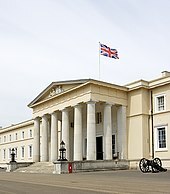 Despite its name, the Royal Military Academy Sandhurst's address is located in Camberley; the boundaries of the academy straddle the counties of Berkshire and Surrey. The county border is marked by a small stream known as the Wish Stream, after which the Academy journal is named. The "Main Gate" is located on the east of the Academy on the London Road in Camberley. The "College Town Gate", which is used for regular access, is located on the west of the Academy on Yorktown Road in Sandhurst. The present Royal Military Academy Sandhurst was founded in 1947 with the merger of two institutions: the Royal Military Academy, Woolwich, and the Royal Military College, Sandhurst. The first Military Academy had been established in 1720 at Woolwich, a town later absorbed into south-east London, to train cadets for commissions in the Royal Artillery. Known as the "Shop", this academy moved to a permanent site at Woolwich Common in 1806 and was granted royal status in 1841. In 1806, the Military Academy took on the training of Royal Engineers officer cadets and, later, Royal Signals cadets. In 1799, a school for staff officers was established at High Wycombe, and in 1801 this became the Senior Department of the newly established Royal Military College (RMC), the brainchild of Colonel John Le Marchant. He opened the Junior Department of the College at a large house in West Street in Great Marlow in 1802 to train "Gentleman Cadets" for the infantry and cavalry regiments of the British Army and of the Presidency armies of British India. Coincidentally, 1802 was also the year of foundation of Saint-Cyr in France and of West Point in the United States. In 1812 the Junior Department of the Royal Military College moved from Great Marlow into buildings designed by James Wyatt at Sandhurst. A few years later, the Junior Department was joined at Sandhurst from High Wycombe by the Senior Department, which in 1858 became a separate institution, the Staff College. On the outbreak of the Second World War, Sandhurst became the home of 161 Infantry Officer Cadet Training Unit (RMC), which moved to Mons Barracks, Aldershot in 1942; for the rest of the war Sandhurst was used as a Royal Armoured Corps Officer Cadet Training Unit (OCTU). The Royal Military Academy Sandhurst was formed in 1947 on the site of the former Royal Military College from a merger between it and the Royal Military Academy in Woolwich, which trained officers for the Royal Artillery and Royal Engineers from 1741 to 1939. Following the ending of National Service in the UK and the closing of the Mons Officer Cadet School in Aldershot in 1972, the RMAS became the sole establishment for male initial officer training in the British Army, taking over the responsibilities of Mons for training Short Service Officer Cadets, Territorial Army officers, and those joining the Regular Army as graduates. In 1984, the Women's Officer Training College Bagshot was also merged into Sandhurst. In 1992, a new Commissioning Course finally unified the training of male, female, and overseas cadets. The Royal Military Academy Sandhurst Collection illustrates the history of the Royal Military Academy, Woolwich, the Royal Military College, Sandhurst, and the Royal Military Academy Sandhurst. The collection includes the Gentlemen Cadet registers, historic archives, uniforms, paintings, photographs, and other artefacts. For the 1948 Summer Olympics in London, the newly created Academy hosted the running leg of the modern pentathlon competition. Contemporary training at Sandhurst was the subject of a three-part television series, first broadcast by BBC television in October 2011, and rebroadcast in April 2012. In 2012 Sandhurst accepted a £15 million donation from the government of United Arab Emirates for the Zayed Building, an accommodation block, named after the UAE's founding ruler. 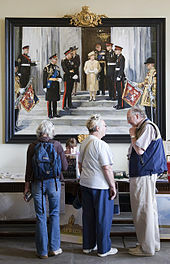 In 2013 Sandhurst accepted a donation of £3 million from the Government of Bahrain for the refurbishment of Mons Hall, named in honour of the men who fell in the Battle of Mons. It was renamed as King Hamad Hall in honour of the King of Bahrain, which generated some controversy in the United Kingdom. In 2015 Sandhurst appointed Lucy Giles as the first female college commander in its history. Potential officers are identified by the Army Officer Selection Board (formerly the Regular Commissions Board, or RCB) situated in Westbury in Wiltshire. Nearly 10 percent of British cadets are female and nearly 10 percent of all cadets come from overseas. More than eighty percent of entrants are university graduates, although a degree is not required for admission. The Royal Military Academy Sandhurst instructors' cadre (group of trainers) is run once every year. The aim is to select 30 Senior Non-Commissioned Officers (SNCOs) from 60 over the course of 3–4 weeks. Instructors can come from any part of the British Army although most are historically from the Infantry. Typically before the 60 candidates arrive on the cadre, they would have had to have passed a 'Divisional pre-selection' course, meaning it would not be unusual for over double the 60 places to be contested. Sergeants and Colour Sergeants (Staff Sergeants from non-Infantry units) attend the Instructors Cadre. The Instructors Cadre is known to be demanding, both physically and mentally, compressing all the prominent physical tests and mental assessments that each officer cadet undertakes over the year course, into 3/4 weeks. This proves and produces the best instructors the British Army has at their disposal. No other instructor posting has a selection to pass in order to be a part of a training team. New colours are presented to RMAS, June 2005. Prince Harry (at attention, to left of horse) is on parade. Sandhurst develops leadership in cadets by expanding their character, intellect and professional competences to a level demanded of an Army Officer on first appointment through military training and education. The course is accredited by various academic and professional institutions. The Commissioning Course lasts 44 weeks and must be successfully completed by all British regular army officers (with some exceptions) before they receive their commission. It is usually followed by further training courses specific to the Regiment or Corps in which the officer will serve. There are two shorter commissioning courses. One is for professionally qualified officers (e.g., doctors, dentists, nurses, lawyers, pharmacists, veterinary surgeons and chaplains). The second short course is the Army Reserve (AR) Commissioning Course (ARCC), which lasts eight weeks. The ARCC consists of four training modules; the first two, Modules A and B, can be completed under the supervision of RMAS with University Officer Training Corps over a number of weekends, or at RMAS where each module lasts two weeks. The final two modules, modules C and D, of the Officers' training and assessment must be conducted at Sandhurst. This training can all be completed in an eight-week period at RMAS, or over a number of years. Upon completion, Officer Cadets become Second Lieutenants in the AR or Officer Training Corps (OTC). Each year approximately 140 candidates undertake each of these two short courses. Both courses are accommodated and primarily conducted at Victory College, RMAS. Sandhurst also runs a variety of other courses for officers including the Late Entry Officer Course (LEOC). RMAS has an academic faculty staffed by civilian researchers with expertise in Communication and Applied Behavioural Science, Defence and International Affairs, and War Studies. Unlike some other national military academies such as West Point in the United States, the École spéciale militaire de Saint-Cyr in France, the Pakistan Military Academy in Pakistan and the Nigerian Defence Academy in Nigeria, Sandhurst is not a university. It only works with the Open University to award the Regular Commissioning Course 120 credit points towards a distance learning Honours Degree in International Studies which ultimately requires 360 points. Graduate entrants can gain a Postgraduate Certificate in Leadership and Conflict Studies from the Regular Commissioning Course and then embark on a pathway post-commissioning to complete a full master's degree from a university through further electives and a dissertation. Borneo Company: The newest Company, which formed up for the first time to begin Commissioning Course 153. Gallipoli Company: the only Company named after a British defeat, formed up for the first time to begin the newly revised Commissioning Course 151. Dettingen Company: the Short Courses mentioned above (for Army Reserve and Professionally Qualified Officers) are operated sequentially, and are each known as "Dettingen Company". Dettingen Company is divided along the same lines as the regular intakes, though smaller courses may consist of only two platoons. There is also a "rehabilitation" platoon—Lucknow Platoon. It looks after cadets who are injured during training, with a view to preparing them to re-enter the commissioning course at the point they left, or processing those who are medically discharged. Cadets who fail to meet the required standard may be "back-termed", that is, "asked" to repeat the previous term and joining a later intake, or to repeat the whole course. Cadets nominate two regiments or corps that they seek to join; this may be influenced by their instructors, if particular strengths or weaknesses or aptitudes are seen to be important. In the middle term, interviews are held and final selections are made by the recruiting regiments and corps; there is competition for strong cadets by the units and, conversely, by cadets for prestigious or specialised units. Exceptionally, so-called "confirmed cadets" may have guaranteed places in regiments before the formal selections or even before starting at Sandhurst. Gurkha Demonstration Company (Sittang): this is a company-sized unit drawn from all units of the Brigade of Gurkhas, to provide an opposing force in battle training for the cadets. 44 Support Squadron, Royal Logistic Corps: this is the RMAS's permanently based transport, logistic and signals support unit. Until 1984, the RMAS had its own band—The RMAS Band Corps, the smallest corps in the British Army. Music is now provided by a variety of Corps of Army Music bands on rotation. The first Sovereign's Parade was performed on 14 July 1948, in front of King George VI. Three Sovereign's Parades are held each year outside the Old College to mark the "passing-out" and the final parade at Sandhurst of the Senior Division. All cadets, except for those who have been back-termed through injury or other reasons, are inspected by the Sovereign (or their representative), participate in the Trooping the Colour and parade past the Sovereign (or her representative) and guests. Guests consist of invited dignitaries and friends and families of the graduating cadets. One of the highlights of the Parade is Trooping the Colour. The Colour trooped is the Sovereign's Banner and the current banner is the third generation of itself, presented by HM the Queen in March 1999; the first Sovereign's Banner, known as the "King George V's Banner", was presented by George V in 1918 and the second one was presented by Her Majesty in October 1978. The honour of Trooping the Colour falls to the Sovereign's Platoon, the then-Champion Company/Platoon. The Sovereign's Platoon, which wears multi-coloured lanyards, using the colours of all three Divisions, is selected on merit and is the best platoon amongst the Division; these officer cadets are chosen from a competition in drill, orienteering, shooting and a cross-country race, ensuring they are of the best in endurance and teamwork. In the past, the Sovereign's Platoon from the Senior Division formed the Colour Party with the Banner on the left flank of the parade; after the inspecting officer had completed inspection, the Colour Party would move to the centre place of the parade before the Saluting Base, awaiting the new Sovereign's Platoon to take possession of the Banner. The new Sovereign's Platoon would keep the Banner until handing it to the next Sovereign's Platoon in the next Sovereign's Parade; they had the privilege of leaving the parade before other divisions after the Senior Division officer cadets had marched into the Old College and the remainders of the parade would salute the banner while they were leaving the parade square. Nowadays, the handover of the Sovereign's Banner from the senior Sovereign's Platoon to a new one dissipates. What replaces it is that the Sovereign's Platoon of Senior Division, instead of the new one, marches to receive the Banner. The Ensign, at the end of the parade, also marches into the Old College whilst carrying the Banner. At the end of the Parade, the Colours and the Senior Division leave the parade ground via the Grand Steps of the Old College building. They are followed by the Academy Adjutant on horseback (the origins of this tradition are unclear). Each Commissioning Course has awards granted to outstanding cadets. The following awards are presented during the Sovereign's Parade. Others are merely listed in the Parade programme. A system of Cadet Government also recognises merit by the appointment of Senior Under Officers, Junior Under Officers, Cadet Sergeants and Cadet Corporals. The Sword of Honour is awarded to the British Army Officer Cadet considered by the Commandant to be, overall, the best of the course. The swords were formerly made by Wilkinson Sword but after the closure of their sword making division they are now presented by Pooley Sword. The Queen's Medal is awarded to the British Army Officer Cadet who achieved the highest scores in military, practical and academic studies. The Overseas Sword is awarded to one of the many cadets from other Commonwealth countries and from foreign armies. The Overseas Sword goes to the Overseas Cadet considered by the Commandant to be the best on each course. The Overseas Award is the equivalent of the Queen's Medal, and is awarded to the Overseas Officer Cadet who achieved the best overall results in military, academic and practical studies. The MacRobert Sword is awarded to the officer cadet considered by the Commandant to be, overall, the best of the Army Reserve Commissioning Course. This sword is also donated by the MacRobert Trust and produced by Pooley Sword. There are two Chapels within the Academy, The Roman Catholic Chapel (Christ the King) and The Royal Memorial Chapel, dedicated as Christ Church, which also contains the South Africa Chapel, which was originally the sanctuary of the second Chapel before it was enlarged. The original chapel was what is now known as the Indian Army Memorial Room. The Royal Engineers designed the original Chapel, which features red brick, terracotta moulding, interlocking pediment copies and corbels in 1879. The Chapel was dedicated by King George VI on 2 May 1937, after architect Captain Arthur C. Martin enlarged the building in a Byzantine style. The Memorial stained glass and Windows in the chapel honour the Brigade of Guards, Rifle Brigade, Royal Fusiliers, and the Hampshire Regiment, among other units. Some memorials, including one honouring alumni of the US Military Academy at West Point, are carved into the black marble flooring. On panels devoted to the particular campaigns in which they lost their lives, are the names of former cadets killed in action. At intervals above the panels are circular tablets to the memory of College Governors. The names of former cadets who have died on active service in the field, or elsewhere are listed in the spaces between the panels. Other tablets on the walls of the porch of the Church were moved there from the old Chapel. At the nave near the chancel steps, old Regimental colours hang from the pillars. The College cemetery has (in 2017) 21 graves and headstones maintained by the Commonwealth War Graves Commission. ^ "Contact us". The Sandhurst Collection. Retrieved 5 September 2018. ^ a b "CC 173 Commandant's Parade". Sandhurst Trust. Retrieved 5 September 2018. ^ a b c d e f g h Sovereign's Parade Programme. RMA Sandhurst. April 2012. ^ "RMAS: The story of Sandhurst". Archived from the original on 5 May 2012. Retrieved 6 July 2009. ^ "Ecoles Des Saint-Cyr (in French)". Archived from the original on 18 December 2012. Retrieved 23 March 2015. ^ Facilities in Sandhurst – 1937 A detailed description by a new recruit. ^ "Mons Officer Cadet School". Retrieved 6 July 2009. ^ "RMAS Archive". Retrieved 29 June 2009. ^ 1948 Summer Olympics official report. p. 47. ^ a b Matthew Teller (26 August 2014). "Sandhurst's sheikhs: Why do so many Gulf royals receive military training in the UK?". BBC. Retrieved 27 August 2014. ^ Tom Whitehead (17 February 2013). 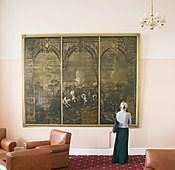 "Row over renaming of Sandhurst hall after Bahrain donation". Daily Telegraph. Retrieved 27 August 2014. ^ "Royal Military Academy Sandhurst to get first female college commander". BBC News. 12 December 2015. Retrieved 13 December 2015. ^ "AOSB Site". Archived from the original on 17 May 2009. Retrieved 29 June 2009. ^ RMAS: The Officer Cadet Archived 22 July 2007 at the Wayback Machine. ^ "The Sandhurst Group SNCO Instructors' cadre". Boot Camp Military Fitness Institute. Retrieved 25 August 2017. ^ "Choosing a Commission". Archived from the original on 9 November 2009. He is placed on the strength of a AR Unit but completes Modules 1–3 of the AR Commissioning Course (ARCC) with the UOTC and Module 4 at the Royal Military Academy Sandhurst. Commission is confirmed by completing Module 5, a Special to Arms Course, a minimum of 1 year and a maximum of 2 years commissioned service. ^ "RMAS site". Archived from the original on 27 December 2009. ^ "Academic departments". Royal Military Academy Sandhurst. Retrieved 23 January 2016. ^ "Officer class?". Royal Marines - Join the Regular and RMR Commandos. ^ "Memorial Chapel" (PDF). Archived from the original (PDF) on 28 February 2008. Retrieved 20 February 2008. ^ "New Banner Parade of the Royal Military Academy Sandhurst (CC 982)". YouTube. ^ "The Sovereign's Parade, April 1985". YouTube. ^ a b "THE SOVEREIGN'S PARADE AT SANDHURST - SOUND - COLOUR". AP Archive. ^ "The Sovereign's Parade At Sandhurst - 1962". YouTube. ^ "Sandhurst Commissioning Parade - 15/04/16 - CC152". YouTube. ^ "From Tottenham to Sandhurst: The extraordinary moment cadet from a broken home on a tough north London estate – who only learned to read aged 12 – received the British Army's prestigious sword of honour". Daily Mail. 15 April 2016. Retrieved 9 August 2016. ^ a b c "178th Sovereign's Parade". Ministry of Defence. Retrieved 21 August 2016. ^ "London Officer Cadet tops course at RMA Sandhurst". The Reserve Forces' and Cadets' Association for Greater London. Retrieved 9 August 2016. ^ "Sandhurst Royal Military Academy Cemetery". Retrieved 19 October 2017. Mockler-Ferryman, A. F. Annals of Sandhurst: A Chronicle of the Royal Military College From Its Foundation to the Present. Whitefish, Montana: Kessinger Publishing, 2007 (reprint; original 1900). ISBN 1-4326-6558-8. Christchurch the Chapel of The Royal Military College: Enlarged and Beautified to the Glory of God and in memory of The Sandhurst Cadets who have died in the service of their country Gale & Polden Ltd, Aldershot, 1937. Wikimedia Commons has media related to Royal Military Academy Sandhurst.